Emotional intelligence can be life-changing, but is there a practical way to go from theory to action? Utilizing a new form of statistical analysis, Six Seconds created an artificial intelligence to find the answer. The new Neural Network report is out, and early adopters are finding the tool does a remarkable job “connecting the dots” for a personalized EQ path… something that might just help all of us. What is the EQ Neural Net? 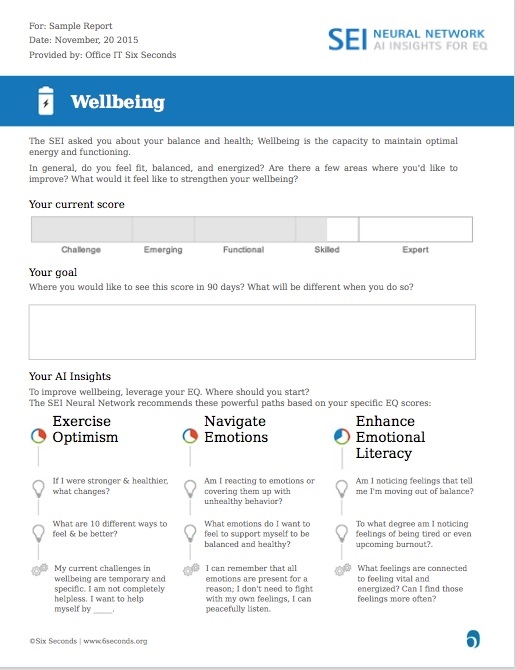 The Neural Net (NN) report applies artificial intelligence (AI) to the results of the Six Seconds’ Emotional Intelligence Assessment (SEI) to arrive at the best possible solution for a particular person to use their emotional intelligence. Joshua Freedman, Six Seconds’ CEO, explains: “In the past, statistics looked at large groups, and we could say that for Mr. or Ms. Average, certain EQ competencies would be key. Now, the Neural Net looks at individual people and finds a path forward. Imagine a computer solving a complex maze — it tests all the different possible paths and suggests, ‘here’s an efficient way forward. '” But instead of a paper maze, the EQ Neural Net offers a path from a person’s current EQ scores toward increase effectiveness, wellbeing, quality of life, or relationships. Here’s a short video to further explain the neural net. There is a sample of a simple Neural Net report to the right. 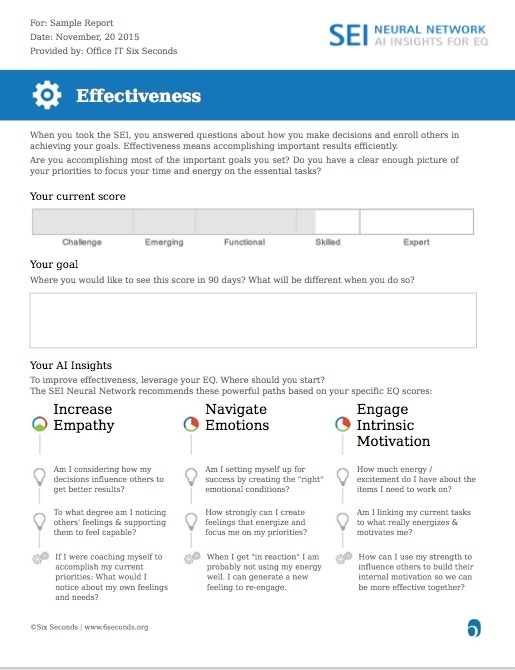 It shows that for this person, based on his current EQ scores and demographics, if he wants to increase effectiveness, his most powerful path forward will be to leverage the three EQ competencies across the bottom of the page: Increase Empathy, Navigate Emotions, and Engage Intrinsic Motivation. 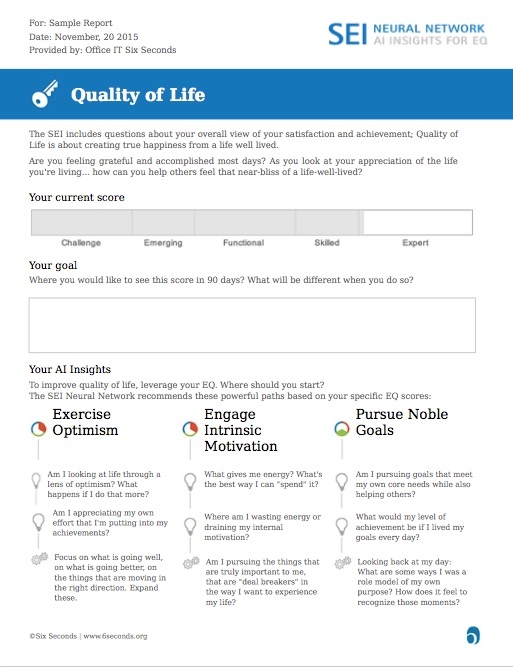 Even more important, it offers personalized reflection questions and tips that will enable this person to apply the EQ competency to the goal, in this case, to increasing effectiveness). Note: The sample Neural Net reports on this page are just samples – every person’s looks different, which is the power of this tool. The NN report, through the power of artificial intelligence, can also reveal dimensions that may not be obvious. As Lynette Vaive, a certified coach and one of Six Seconds’ Regional Network Directors, commented, “Looking at the outcomes for one client on their empathy score, it takes the coaching in a direction I might not have gone otherwise.” Lynette’s experience is reflected by many of the early users of the tool: While we each develop expertise with a tool over time, the artificial intelligence offers a unique, unbiased perspective. Jayne Morrison, Six Seconds’ Regional Network Director in MEAI, found that the tool sparks action. “You can literally send someone this sheet alone and give them some areas to work on.” Because the Neural Net is totally personalized, individuals quickly relate to the questions and tips. This is a key insight: It’s not enough to describe emotional intelligence or provide a diagnosis: People need to see how they, personally, can step forward. Learn more about the artificial intelligence for emotional intelligence. If you are an EQ professional or simply passionate about emotional intelligence and intrigued by the latest developments and how they could apply to your life, now is the time to explore Neural Net. To learn more about Neural Net, please view this page about the Artificial Intelligence for Emotional Intelligence — or download the brochure. To experience it yourself, click here to order the EQ assessment plus1-1 coaching session with a certified assessor — and receive your own Neural Net report.